A home by the river's edge doesn't have to be look like a cabin or fisherman's hole. This modern take on the yachtsman's home is eclectic, sophisticated and oh so charming, while also being functional, practical and exquisite with views and serenity located in a natural river inlet. 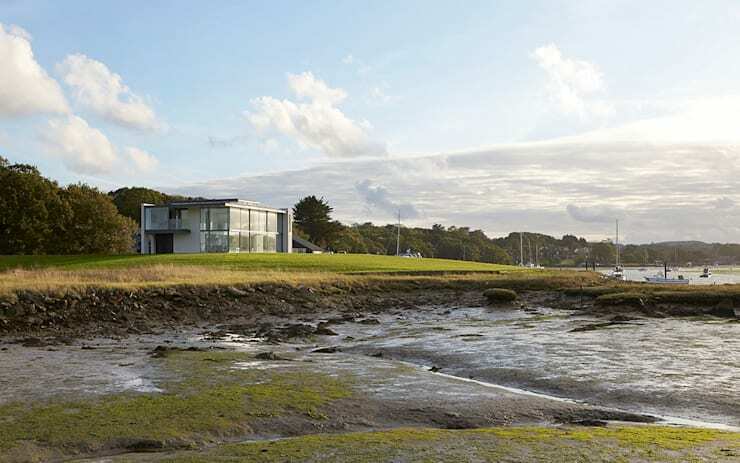 This home is situated on the Isle of Wight and is designed by The Manser Practice Architects & Designers. The owner anticipated a modern home that is sustainable and accessible by boat. The wonderful establishment was no easy feat to put together as there were many restrictions in place. The site had an existing industrial use and fell within an Environmental Agency Flood Plain— to tackle this problem the team designed the property as part of a mixed-use scheme, including a marina and a series of light industrial units, hoping to bring about economic, social, cultural and environmental benefits. The front façade of this home on the edge of the marina has a completely opposite look when compared to the back. Long rectangular windows supply some natural light allowing for this side of the home to have its fair share of daily illumination without it being too bright. The open driveway is perfect as this house is sort of a lone wolf in the area as no other dwelling can be seen in the background or next door. This allows for the inhabitants to know if people are stopping by for a visit or to just enjoy the scenery. 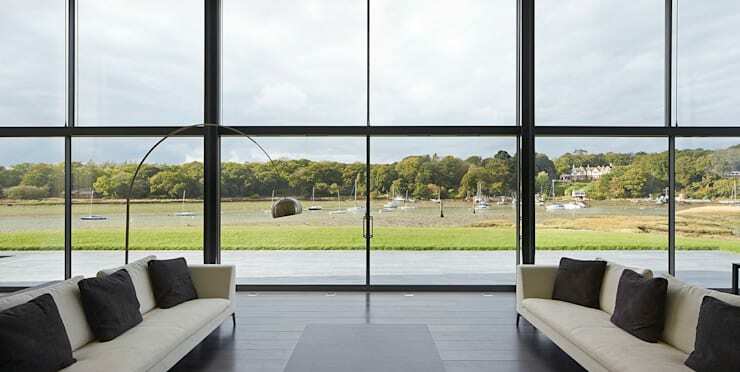 The symmetry of the windows allows for appreciation of clean, simple lines and geometry, making this home a yachtsman's dream in every way, functional, light and at the water's edge with nature literally just a stone's throw away. Who wouldn't want to live here all the time or even make it a regular weekend getaway spot? Living this close to a natural river inlet is the perfect way to admire the beauty that comes with having nature on your doorstep. It's an amazing sight to wake up and certainly will be an even better sight and sound to fall asleep to at night. Surrounded by the greenery that is the natural environment and ecosystem, this yachtsman's escape will be appreciated not only by those who enjoy sailing or being at one with the water, but will also be loved by anyone who appreciates nature and modern amenities in a simple setting. The fresh air and cool breeze that comes with a home such as this is evident in the picturesque setting. It's much more than a place to build a home, it is in fact an escape from the hectic city life and working world. The serenity and peace that comes with living on a river bank is truly priceless. Just as much as the outdoors and overall exterior structure of this home can be acknowledged and adored, so too can the interior of this home be admired for its simple decor and design. Aside from the structural beauty and integrity of the home, the adoration is still drifting towards the view, which is almost like a live painting. The greenery is all its splendour can be fully enjoyed from this angle and the large glass windows and doors open up onto a terrace, allowing for fresh air and a gentle breeze to flow steadily indoors for all to enjoy. The bright and light atmosphere of the environment flows in from the back area of this home, allowing for it to remain illuminated during the day, but just imagine the star gazing and appreciation that can take place here at night! With the clear air and clean surroundings, it would probably be magical. This living room area translates the modern minimalist and uncluttered approach perfectly indoors, making this room just as splendid as the exterior. The natural light flows in from all angles and allows for fresh air and ventilation to venture into this lovely home. While the use of neutral monochrome tones allows the simplicity of this home to remain understated, classic and elegant, the main draw card for this home is its setting. All other aspects of the house are modernly sophisticated and chic without being ostentatious. The natural dark wood floors complements the large white sofas with the inclusion of an L-shaped sofa too, this maximises seating area and is also a good place to just relax and enjoy the sights and sounds from the marina. The dark wooden coffee table finishes off the room, while the transparent glass balcony above ensure that the modernity of the home is carried upstairs as well. The stairwell emphasises the modern look of this home up to the upper level too, the all-white walls accentuate the brightness and illumination of this part of the home, with a touch of silver for a polished futuristic look, while the steps are darker wood and allow for the classic and timeless factor to be included. This sleek and modern stairs gives the upper level area an edge, while the area itself has a sort of optical illusion about it with a series of raised platforms and geometric lines and clean edges adding to the overall fascinating indoor structure. 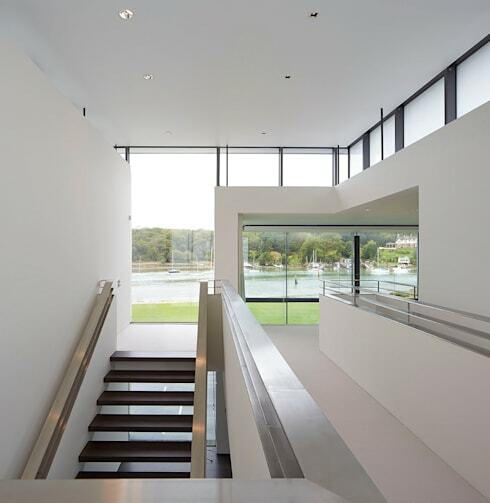 The stairs are surrounding by large wide and natural light inducing windows, this means that it will continue to be bright and airy throughout the day, while the stairs will also be a beautiful enchanting place to experience the sight of the river at night. Quite a beauty from all angles. 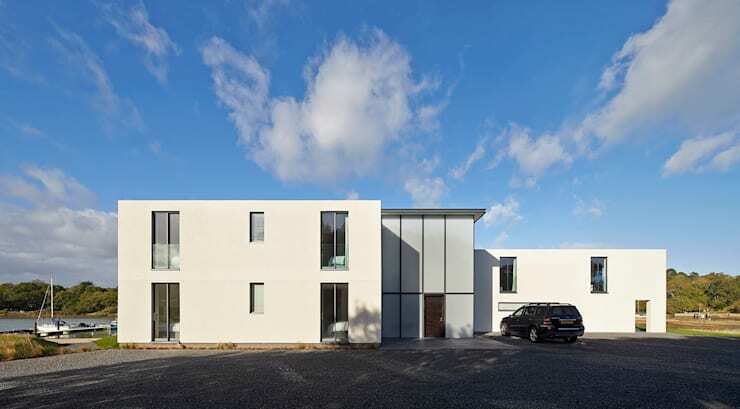 So while the front part of this home was completely white and brightly illuminated through the all-white exterior, the back of this home is completely opposite, with large glass windows and doors throughout allowing for maximising the natural light and views of the marina. This makes for a majestic home to be in and to see from a distance, set in so much greenery and taking in the natural environment as part of the home itself. The illumination of this home from the inside provides just as much beauty as the outdoor illumination, the scenery at sunset in the background sees the blue sky seem even bluer. This modern double storey block home is more than just charming, it is the future of nature living and loving come true. For more UK home inspiration check out: Top 10—The Most Beautiful Houses In The South. Would you love to live by the water? Let us know in the comments, below.